For two months, my sister Margaret has been in the hospital, in hospice and now a nursing home. I fly to Cincinnati to visit her August, 2016, and to give my 90 year old brother, Chuck, and his daughter some support. He is her primary caregiver, executor, and power of attorney. I have an haunting encounter enroute with a guy who carries a message. An obese black guy arrives after I am seated. As he works his way into the window seat beyond me in the middle, he apologizes saying, "I hope I don't lay on you.” Perhaps he means that his flesh presses against mine because of his size and he regrets that. Not knowing what to say and not wanting to engage, I say nothing. Maybe I grunt, meaning there's not much either of us can do about this. It is what it is. I dislike sitting by fatties whose flesh encroaches my space. “I'm Nancy. My sister is 88, is in hospice, and I'm going to check on her.” These sharings connect us. He leans toward me, offers both hands, lowers his head, and starts praying. So here I am with his blubber joining my left side and now we are also joined voluntarily by our hands. Our heads almost touch. The words go on for a while. I'm uncomfortable and hope it's over soon. Then we walk to baggage and ground transportation. He struggles with his bag, admits to knee problems. Other travelers step around us as we negotiate moving walkways. Once he steps on each, he stops to rest causing others to excuse-themselves past us. I am in no hurry since I learn by text that Chuck has suffered a flat and is delayed for my pickup. Eric tells me our meeting is not accidental and that we must give a positive spin to our mutual goal. Put a little love in there is his message. Today I visit Margaret and remember Eric's suggestion. My sister needs love and human contact since her history has been mostly isolation and alienation. Our conversation is meager, the oxygen machine is noisy, and her words are few. “I want Nancy to meet Carol,” she tells our brother Chuck in a rare lucid moment. Carol has been her shopping buddy for many years. When together, they reminisce about estate shopping excursions they enjoyed through the years mentioning specific purchases. Costume jewelry. Margaret loves her things and wants to take them with her. “Put it up,” she barks. Margaret giggles at this memory. Margaret has unfinished business and maybe resists dying because of this. She's telling herself scary stories. When she pats Chuck’s forearm with a shaking hand and says, “I'm so glad you could come,” he suspects he is now Stanley, her deceased husband. So I'm wondering if there’s a way I can help her express regrets? Maybe coach her to make amends to family members? She lacks the willingness and ability to do that for herself. Maybe she can hear the needed words, might approve, and maybe even sign them. But then I might be dreaming. Here are pending notes I'm offering for her signatures: one to her estranged son, Woody, her caregiving brother, Chuck, her alienated sister, Linda, and her attentive niece, Pam. Before I go, here are a few words I wish I could say to you in person. I know we've had our differences and always have. However, please know that I am proud of you. You are bright and creative and have done well in life by anyone's standards. I wish I had the courage to say I love you in person, but here it is on paper: I do love you and wish you well as you continue your journey without me. You are my dependable and faithful brother always there when I need you. What would I do without you? I will say on paper what I can't seem to say in person: thank you for being my support system in old age and for settling my affairs after I'm gone. I know this is a difficult and thankless job for you. I have no one else able and willing whom I can choose. So thank you. I love you. We are each older now and dealing with serious health issues. Nancy is helping me write some final words to several family members. I regret our differences and would like to make amends. Sometimes I say things and have angry feelings I later regret. These words are my attempt to make peace with my human frailties. I love you. I feel fortunate that you're here for me in my time of great need. In my right mind and body, I would hug you and thank you for finding the time for me. You are the daughter I never had. Yes, Eric, I'm putting the love in there hoping it'll be received. My dying sister needs more help than I/we can give. Just maybe these brief notes and the presence of those who care about her can bring some peace and allow death to come. “Good Show!!! It was super having you...and thanks for your help. I just returned from my daily lunchtime visit. Margaret was wide awake and fed herself lunch. Ate about one third of their offering. Sorry...but she doesn't remember your visit. Wanted to know why Meme (our deceased mother) has not visited. Margaret died September 5, 2016. She died two days after signing the above family notes. Nancy is now creating a joy-filled life with Bill Harrison in Decatur, Georgia. 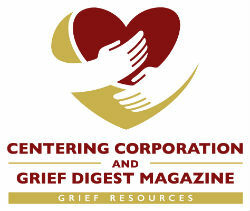 This sister story is her third contribution to Grief Digest. She has two children, a couple of inherited grands, two great grands and three grand dogs.